I think the fall weather has brought my knitting mojo back! No, I didn’t knit an apron (thank goodness! I can’t even imagine trying to knit an apron), but I’ve been thinking about knitting more again. I’m actually excited to finish a few things soon, which means I’ll have some fun stuff to share. So since I haven’t had a ton of knitting going on, I’ve had more sewing. You can see part of my awesome garlic braid in the background. I’ve had this pattern and the brown and green fabric for almost two years. While browsing Piece by Piece I found the birds which I felt would be perfect. I wanted something that incorporated the green and brown, but wasn’t too matchy, matchy. Even after getting the fabric it took me a little while to get to the sewing. All fabric and yarn apparently needs to spend some time steeping in the stash until it’s ready. I love the pattern and really didn’t change anything. I didn’t do the velcro, the neck piece fits fine over my head. I’m much more likely to put this apron on while I’m cooking. Before, I used to forget to put an apron on until after I’d messed up my clothes. Now, I put the apron on first and am often caught wearing it well after I’m done cooking. The pattern is printed on nice thick paper so it’s going to be easy to use multiple times. (Which I already have plans to do.) 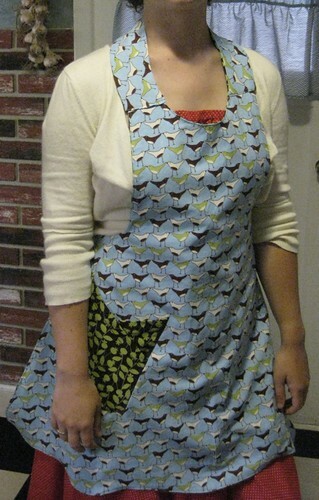 My favorite part about the pattern is that it has a spot to put who you made the apron for and the date. Just the right personal touch. I love that it’s reversible too. The thickness of two pieces of fabric feels great and I can put whichever side on that I’m in the mood for. 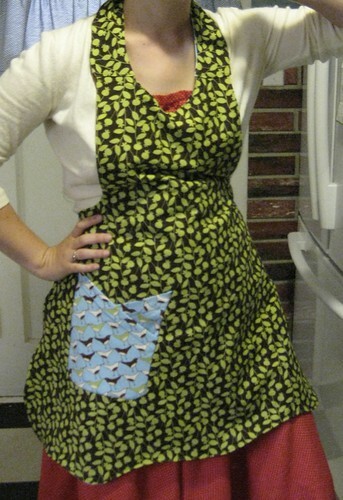 Oh my gosh that is the cutest apron EVER! I’m going to buy that pattern. Thanks! They may have it at Piece by Piece… I know they can order it if they don’t. It’s called the Church Ladies Apron. Very cute Jodie. I like the fabric that you chose and that it is reversible.